This is a piece that is very uniquely done. 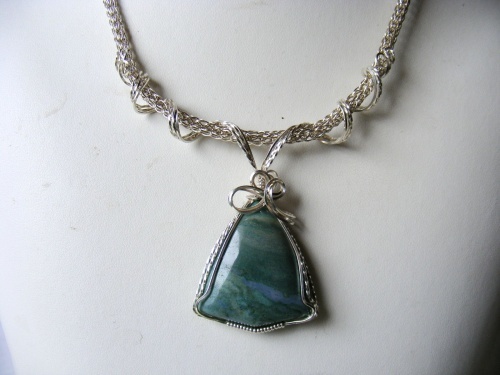 The chain is a handmade woven viking knit chain with a focal of aventurine gemstone which is wrapped in argentium silver and coiled around the chain. Being in argentium this piece will not tarnish as easily and thus keep its beauty for a long time. Its also very easy to take care of. The piece measures 18" has a fancy sterling silver clasp.